Here’s a dish that exemplifies Mark Miller’s talent and culinary influence. It’s served in the restaurant’s rooftop open-air Cantina today. Serve the corn cakes garnished with scallions—or with dollops of guacamole and salsa. In a medium bowl, mix together the dry ingredients. In a large bowl, whisk together buttermilk and butter, then whisk in egg. Gradually add dry ingredients to liquid and whisk until thoroughly incorporated. Puree cup of corn and fold into batter along with remaining whole kernels and scallions. If batter is too thick to spoon easily, add a bit more buttermilk. Using a nonstick pan over medium heat, ladle corn cake batter and form 3-inch cakes. Cook until golden brown, about 2 minutes per side. Repeat for the remaining cakes. Peel the shrimp. On a griddle or in a frying pan, cook shrimp in 3 tablespoons butter over low heat for about 5 minutes, turning once. To prepare chipotle butter, mix together softened butter and chipotle puree and set aside at room temperature. 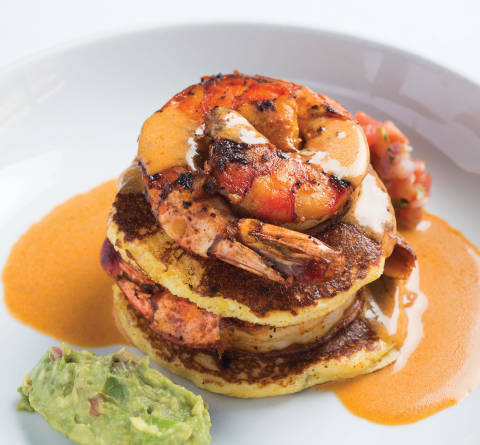 Stack the shrimp and corn cakes, spread the chipotle butter over it, and garnish with scallions or guacamole and salsa.